Thanks for being polite about my yarn snobbery. 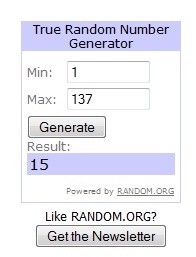 The winner is number 15, Stitching Life! Congratulations! Oh, oh too fun! Thank you Christina! I am trying to learn to knit and will put the yarn to good use! HAHAHA..when I first read your post title my brain saw, "The yam has a home."